With Kat off tonight, family visiting in Boston, we welcomed back UFOlogist Thomas Wertman of MUFON. Thomas spoke of a recent fall, all of two feet, breaking his femur. Henry asked about recent sightings. Thomas spoke about recent Ohio sightings, including an apparent southern Ohio flap. One of Thomas's investigators was able to piece together evidence that it was actually military air training exercises. Thomas also revealed how he vets a witness, checking various social media profiles. He also spoke about an army reserve who'd just retired after twenty years, who spoke of UFOs that would buzz US battleships, and the pilots on the battleship stopped "bothering" chasing them, as none could catch up to the UFOs, so such became pointless. He spoke about a sighting he'd had in his youth out in the woods. When his friend fled, Thomas's memory fixated on the face of a White Owl, a frequent metaphor imagery of seeing a Grey Alien. Thomas discussed interviewing commercial airline pilots, who usually only spoke on condition of anonymity. Ceiling Cat Barbara Duncan suggested about private charter flights, including but not limited to viewing eclipses, the northern lights, et al. Most of such, Thomas observed, have passengers not paying attention to what's going on outside their windows. CC reported our having listeners tonight in the US, the UK, Germany, Canada, Australia, Manilla, Singapore, and Unknown. Thomas discussed the enthralling Coyne UFO case in Ohio, even tracking down, meeting, and interviewing some of its key witnesses. Having been given a regression therapist recommendation, Thomas went and was one of the best patients, to the surprise of the regressionist. Thomas recalled seeing a probable grey during the White Owl incident, which tried mind-probing him. To the creature's astonishment, Thomas was able to reverse it, and see into the creature's mind, suddenly able to perceive Everything around him. 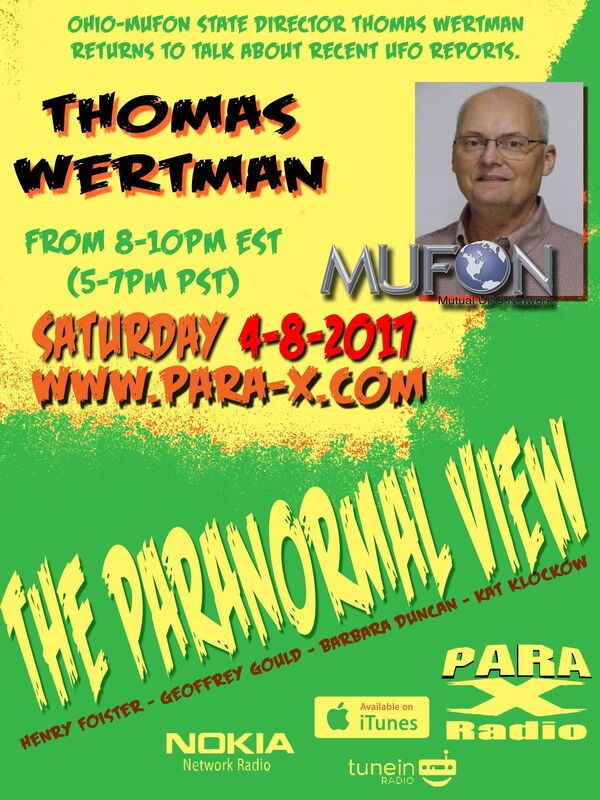 08 April 2017 The Paranormal View.